I have been absent for two months now. A lot has happened. The good news first: I have a beautiful daughter named Savannah. She was born August 26 at 6:25pm. 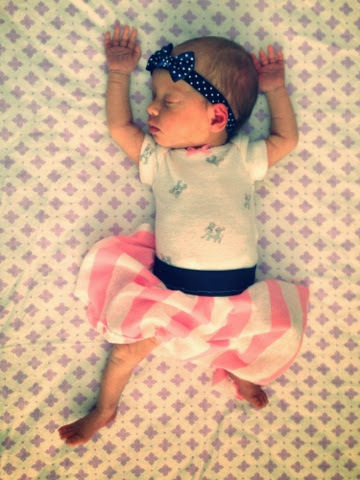 She is the most beautiful little thing I've ever seen! On August 25 I went in for my regular NST and the nurse was having a hard time separating out the girls heartbeats, I told her that had never happened before and she probably wasn't getting A's because she always difficult to find, but she insisted it was normal for twins to have very similar heart rates. After being there for over an hour and having the beats be the exact same she said she thought it looked okay but would have the doctor look at the graph to make sure he saw what he needed in A's heart rate changes. 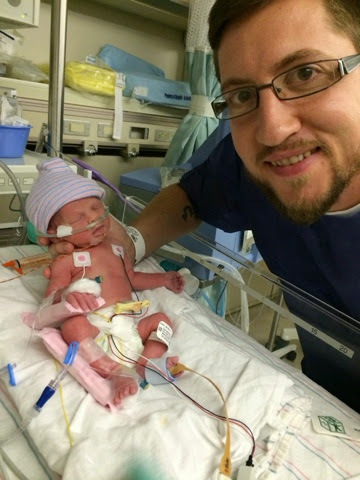 When my doctor came he said that the monitors were picking up the same heart beat and that he would do an ultrasound to see where baby A was so they could correctly place the monitor and start again. When he did the ultrasound he could not see A's heartbeat on the machine. After continuing to look for a few minutes he called two other doctors who were more educated on the machine for second opinions. Both doctors saw the same thing. We don't know why or how but our twin A had passed away. We had just seen both the girls on the ultrasound the previous Thursday and they were both perfect. Since our twins were in separate sacks and didn't share a placenta the doctor said I could still carry twin b for as long as I wanted without risk to her, or I could deliver her early. The choice was mine. 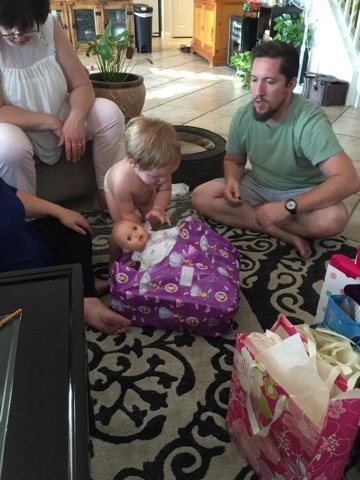 I didn't have to think about it at all, I did not want to be pregnant and longer knowing what I had just found out. So my c-section was scheduled for the next day. August 26th was both the happiest and saddest day of my life. 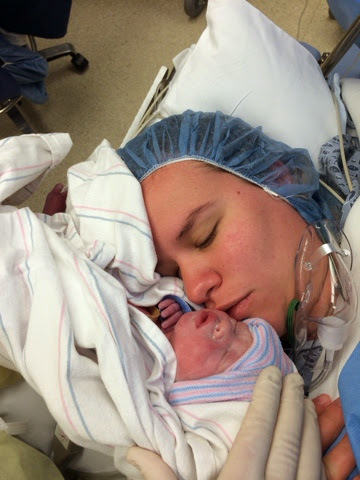 I delivered my girls via c-section at 33 weeks and 2 days gestation. If I had thought about it at all I would have requested to go under for the surgery rather than stay awake. First of all it was actually a lot more painful than I was led to believe. I also had a panic attack during the surgery and was lucky my husband is amazing and got me to calm down. I fell asleep after he talked me out of it, but I do remember still hearing what was happening. At one one point the Anesthetist kept telling me to wake up. Apparently when I went to sleep my breathing slowed down too much, so they had to keep waking me up. There was a lot of buzz in the room while they were working but it all went silent when they pulled twin A out, that's how I knew she was out. We decided not to see her body but requested pictures to be taken of her so that we could see her when we decided we could handle it. I still haven't looked. A minute later twin B came out and I heard a tiny little cry, more like an unhappy grunt, and they tried to show her to me over the curtain but all I could see was a tiny foot. After a time they brought Savannah back over to me and put her head next to mine so I could kiss her and then they whisked her to the NICU. I was pretty out of it at this point but I do remember how warm her cheek was next to my lips. The hospital gave us a "memory box" of the pictures and other mementos of twin A for us to take home, which I assume includes her birth info but I haven't been able to open it yet. So I only know her birth date. 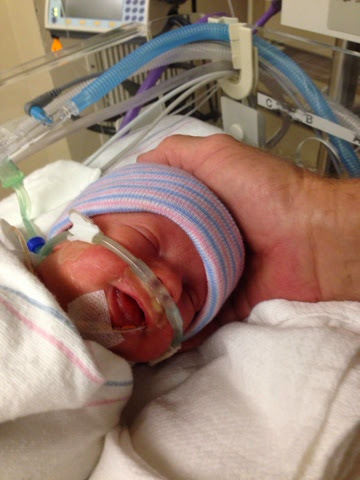 Savannah spent 18 days in the NICU and was a rockstar. She tackled everything and improved so quickly. The only "problems" she had were jaundice and choking on her food and forgetting to resume breathing afterward. She was under the Bili lights for 2 days and never had to go back. Thank God! It was really sad to see her under them. Once they started her on bottle feeding she really took off! The nurses and doctors said they had never seen a baby do so well so fast. The first time she ate without a feeding tube she downed the whole bottle in 10 minutes. They standardly give each baby a half hour to eat as much as they can and normally they babies use that full time and only eat a portion of the food. I was quite proud of my little piglet. She has been home 11 days now and has been doing great. She gained weight and is nearly 5lbs now! I love her very much and am so happy to have her around. I still think about Scarlett everyday. It's a strange feeling to miss someone you've never met, but I really do miss her and I probably always will. I am thankful to have Savannah around and I will love her until the end of time! I may or may not continue blogging, but I will be checking in on my blogger friends to see how they're doing. I'll leave you with some photos. She was 1 day old and already smiling! 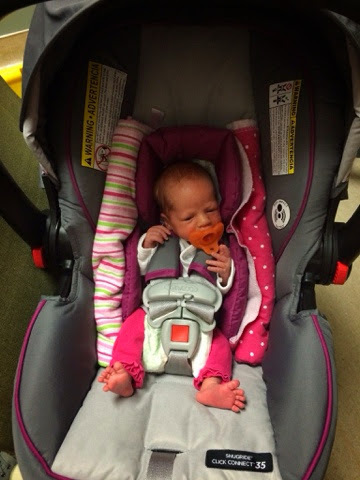 This was after her first doctor visit. All tuckered out. Oh Sausha! I'm so sorry you weren't able to bring both of your girls home with you. But I am so happy you have Savannah. She's beautiful. This is the happiest and saddest post... Congrats on your beautiful little girl, she is adorable. And saying lots of prayers for sweet Scarlett, she is in heaven with Jesus and you will see her again one day. Hope you continue to blog and keep in touch!